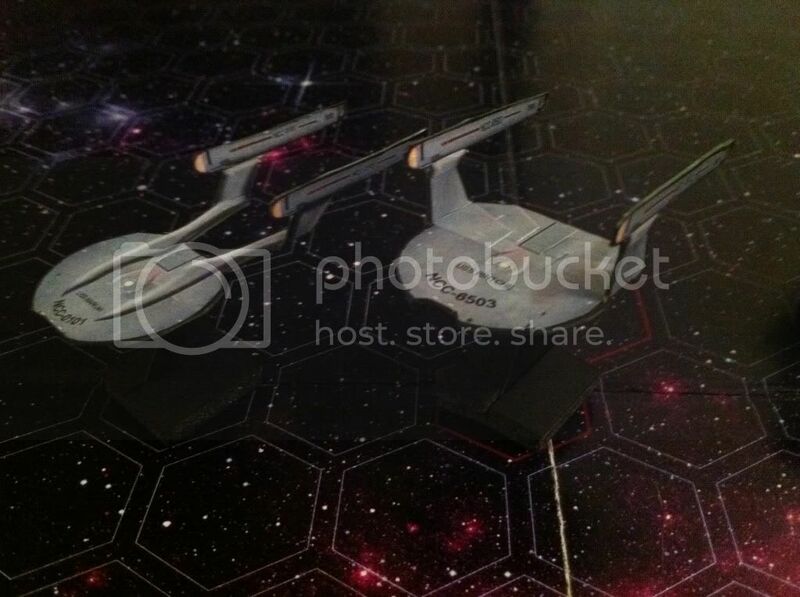 I think it is safe to say that these are gamepieces, not scale models. To have scale models in a game would be very difficult. I think of momir farooq's Star Wars pieces for Starship Battles. You have to be able to see what ship is where. Doing the ships in scale would make the game tedious. I can just see the players with flip-down magnifying lenses strapped to their foreheads ... LOL. Better to think in terms of gamepieces than models for these. Yes, I'm very much taking the game pieces approach. The Klingon BOP is half the size of the cruisers. I know it should be about 1/4 the size, but that would be too small to build sensibly. Not only the ships, even the game.... wow again! I hope that you include they rules for creating your own ships. 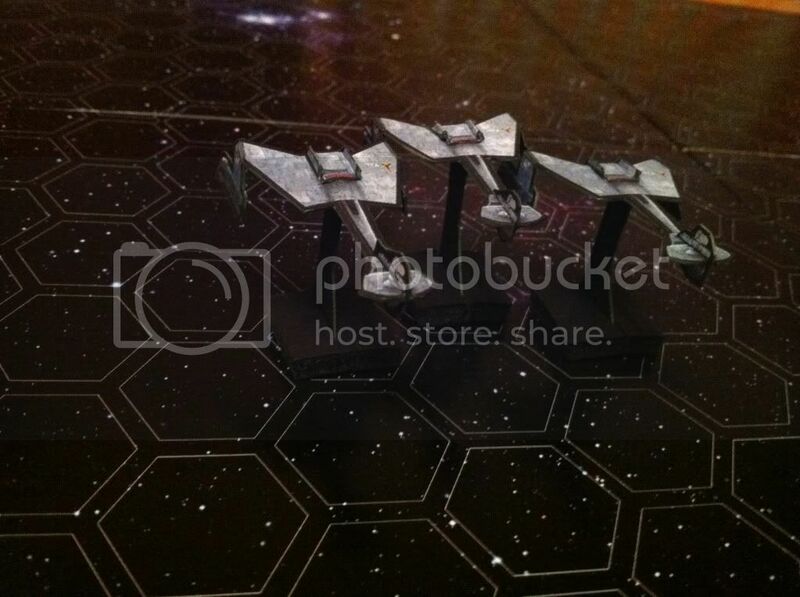 I want to use my Star Wars ships and see the Millenium Falcon wipe out the Romulans! 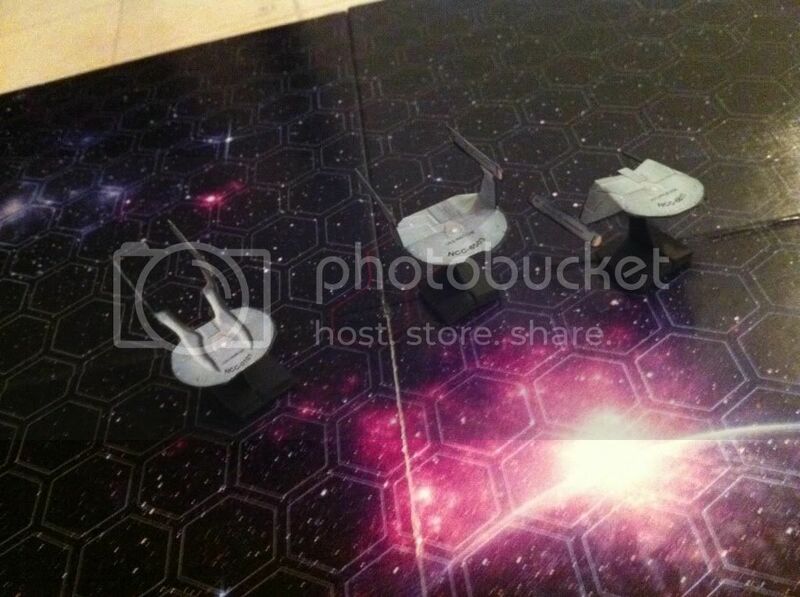 (Remember, the Romulans ALSO used Klingon Battle Cruisers)! This does look good. I was leaning the game-piece way myself, but I still think shuttles would be out of place. Maybe just a counter. What "battle map" is that? Okay, I found this thread, & I had to register. Please, Please post the ships, (& one with a blank saucer so we can customize!!) and I'd like to request a "bridge crew" series. I've yet to play a game, other than Heroscape, that didn't work better gridless or on a square grid. 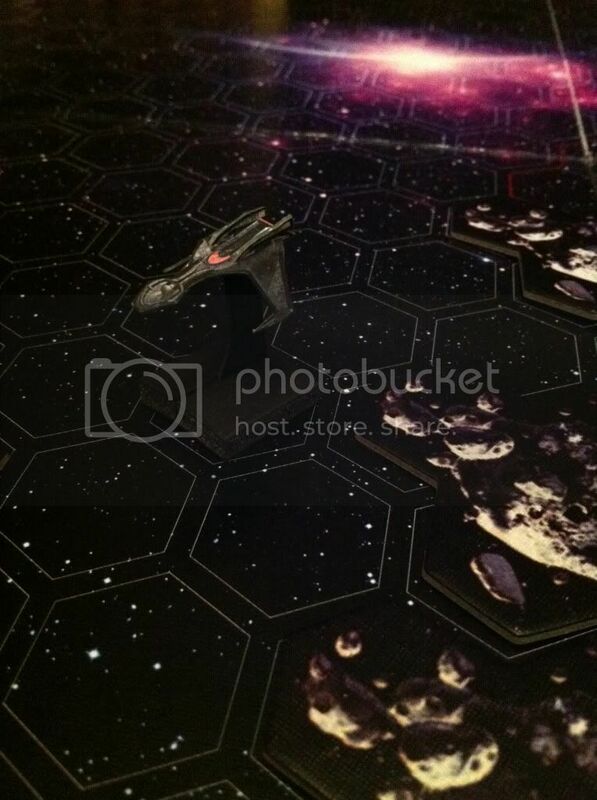 Printing a 90% black hex grid for my space battles is not something I would look forward to. While i'd choose a hex grid over a gridless map everyday, i concour that going from hex to measuring is often easy. But how can a square grid be right for a "free movement" game like a skirmish in the void? Hex grid gives you 6 directions you can go from the center hex. Squares give you 8 directions you can go from the center square. I am just used to hexes and never considered anything else. You can print out blank hex sheets fairly cheaply. 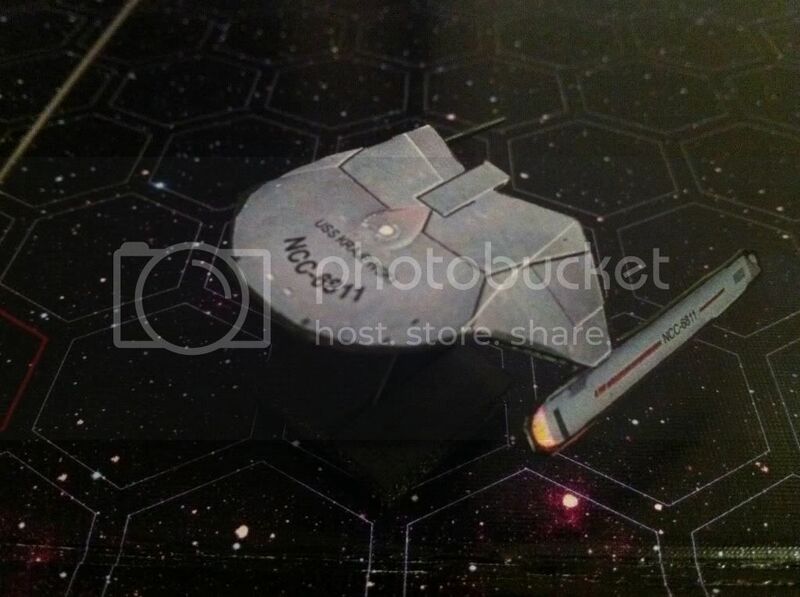 MANY fairly well priced hex sheets are available for spaceship wargames. I wrote this game with hexes in mind. That said, using 90 degree angles for turns would work... 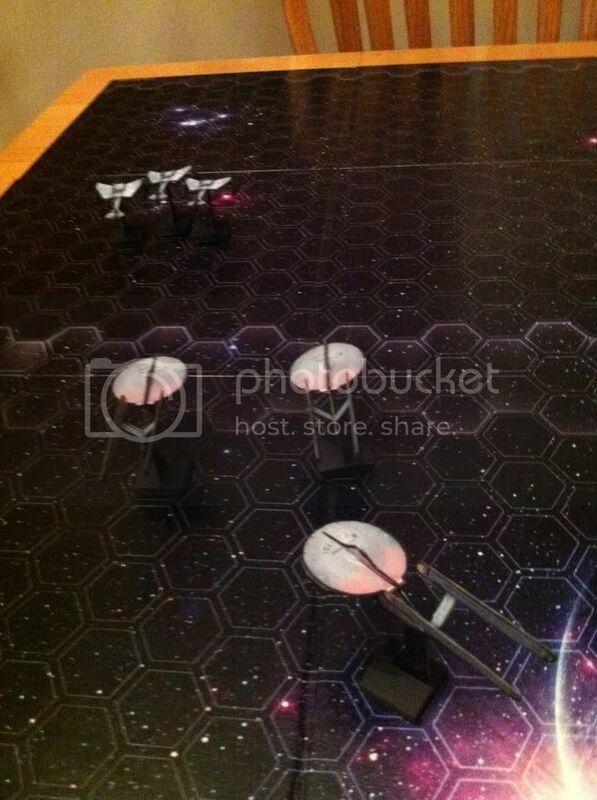 I don't know... Hexes just seem ... logical for this kind of wargaming. I suppose I'm old school there. Baxart! Thanks for your kind words and welcome to the boards. There are some amazing people on here and tons of talent and creativity. Kiladecus! There will be ship creation rules. My actual release of this game will not be Trek-related, but the trek ships will be offered as a free download for people as a total fan thing. They will be compatible with the rules. 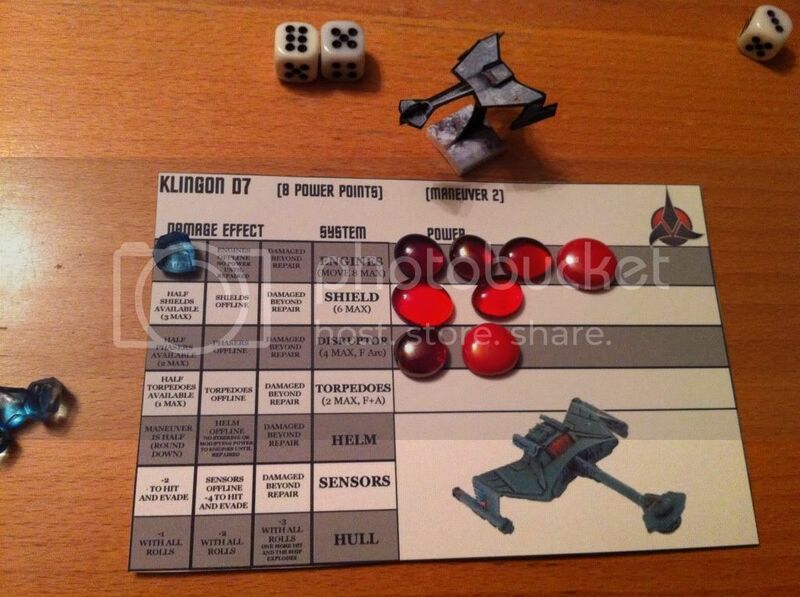 The game will have a generic system, but the 'fluff' will be for Retrospace ships. Imperiax War-Rockets off the starboard bow! The game cards will need to be modified a bit to reflect some changes brought up in playtesting. Should be a better, more strategic game because of it. I just bought a ton of glass beads today. I intend on launching a wave of mayhem through the galaxy. Would printing the grids on transparencies work? I've seen Star/Galaxy posters around. Just put the grid transparencies over your poster, or black paper, if you choose. Yes printing on transparencies would be perfect. Home run! 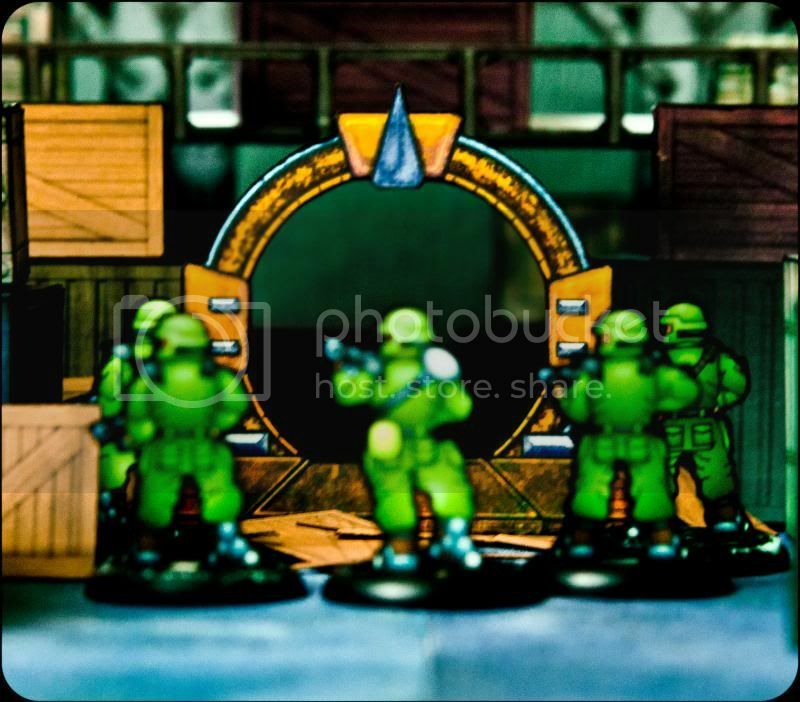 I just checked, these are about 32mm so they're in Heroscape scale! Booyah!!! I've used the horoscope orcs as lizard aliens in my campaign. I even used the Romans in the game I'm running. Lots of good minis out there. Taking a break from studying for my final exam in Greek tomorrow morning. I've been pretty much swamped since September. But I am REEEEALLY looking forward to a ship-to-ship retro space game, especially if the ship-to-ship combat can be married to boarding actions! I wonder how easy it would be to convert your retro-space skirmish game to a wooden ships setting... obviously the cards would have to change... maybe instead of engines generating power you have masts, etc. We say that in English too. And yes, I also have those little plastic ships. I keep meaning to make paper versions because the paint is nearly worn off my favourites. And then I think I could make up rules for designing your own ship and then I want to introduce rules for wind and then I think about a second scale with large ships and figures for boarding actions and then . . . I've been wanting to build it for a while. We got the crazy idea to mount the field on a magnetic white board (vertically like a wall instead of flat like a table top), then put magnets in the bases of the models. Hey, I did a Romulan Bird of Prey. All one piece! Of cours, in the OS only the bottom of the ship was painted with the bird, but who wants to be a Romulan if no-one sees your cool paint job? So I adapted the bottom of the bird to look like the top of a bird and I put the bird on top. Besides curling the engines, all you have to do is put some glue on the underside of the tail and pinch it into a dorsal fin. This will also have the effect of making a cone out of the front of the ship. Bend up the wings a bit and you are done. edited by Squirmydad-> I moved it from the Retro Space thread to here. Thanks SD, the Wall Mural section has HUGE images meant to printed at the scale we would likely find useful for covering a gaming table. For Christmas I'm making custom starships for my friends. I have 3 of the 5 done. Just need to make some custom cards for them as well. I appreciate that you did that for me, Dave, but you didn't have to. Seriously... It looks good. The nacelle supposrt look a little long though. If you look at the Reliant style-light ship, the supports weren't very long. Just an observation (I had my "Parduz" on). Very Cool! How did you make the "pilons" on NCC 0101? Just an observation (I had my "Parduz" on). So now i am an annoying device, huh?